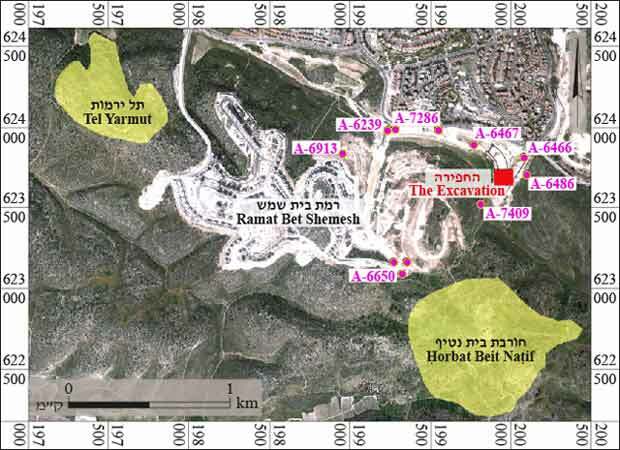 In August 2016, a salvage excavation was conducted in Ramat Bet Shemesh M3 (Permit No. A-7788; map ref. 199906-70/623714-36; Fig. 1), prior to construction. 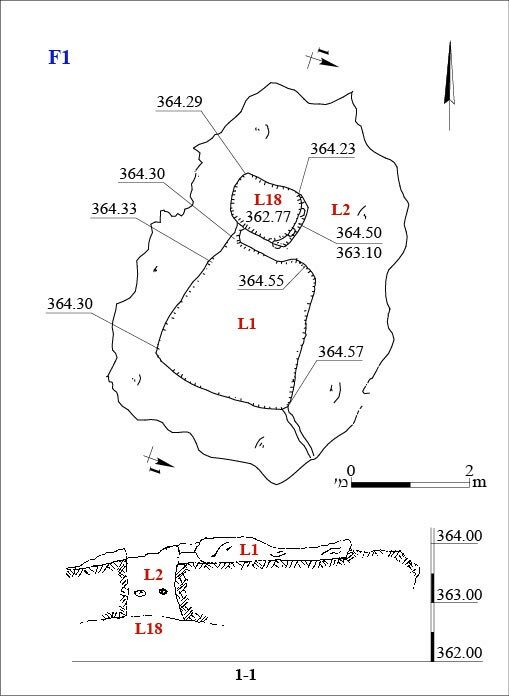 The excavation, undertaken on behalf of the Israel Antiquities Authority and financed by Mr. Eldad Halevy, Esq., was directed by S. Dallasheh, with the assistance of Y. Lavan (administration), A. Hajian (surveying and surveying), E. Belashov (plans), D. Levi (location map), I. Radashkovsky (GPS), A. Peretz (photography), I. Lidsky-Reznikov (pottery drawing), A. Shadman, Y. Zelinger, S. Gendler and G. Shlimovich. 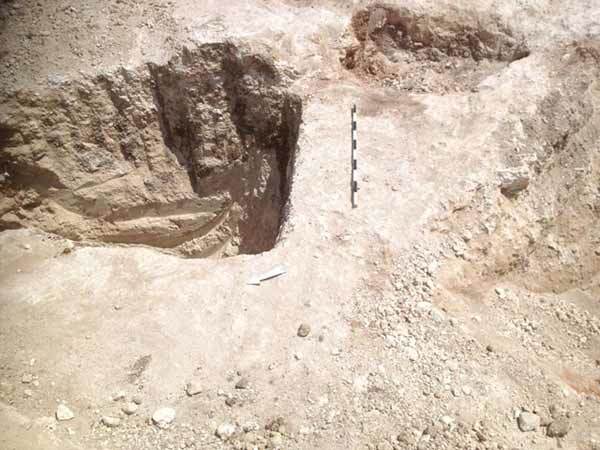 The excavation was conducted on the slopes of a moderate hill north of Nahal Yarmut, west of Khirbat Umm el-Diab and north of Horbat Bet Natif. Six spots with antiquities (Fig. 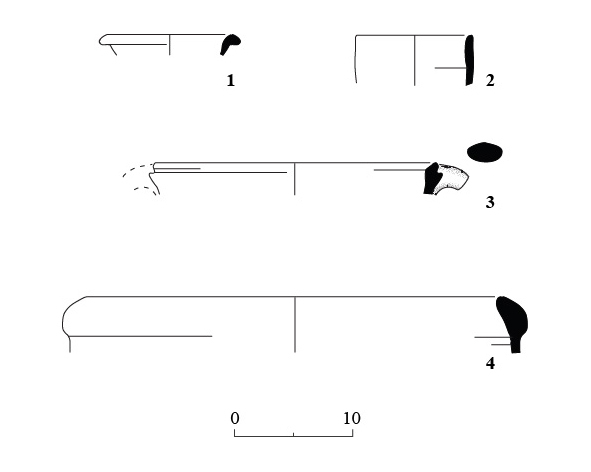 2) were identified that had been seriously damaged during development work prior to the excavation: three winepresses (F1, F2, F5), two of which included caves, hewn in a later phase (F1, F2A); a stepped installation that was probably a burial cave or ritual bath (F2B); a quarry (F3); and a rock-hewn pit of unclear nature (F4). 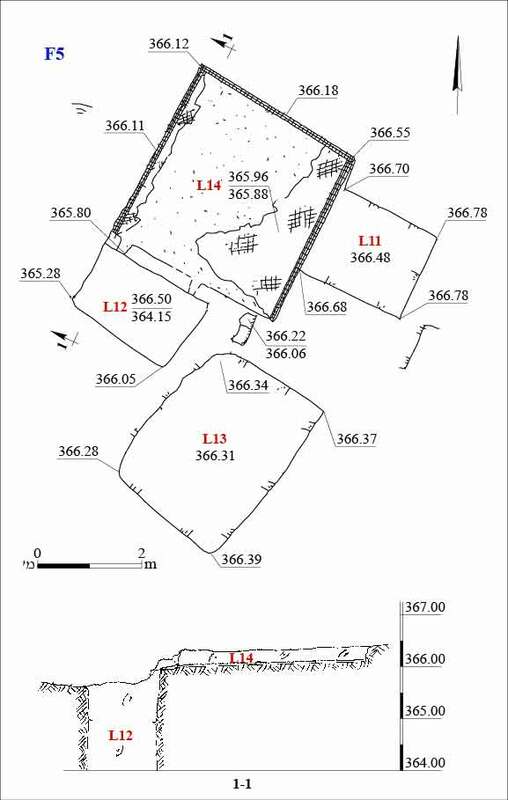 In the past, comprehensive and localized surveys (Dagan 2010, Nagorsky 2010) were conducted, documenting a variety of finds such as architectural remains, sections of roads, field walls and agricultural terraces, winepresses and bodedot, water cisterns and wells, a columbarium, storage caves, dwelling, burial and natural caves, stone-clearance heaps, rock-hewn installations and quarries. In recent years, excavations carried out in the area revealed caves, winepresses, building remains, rock-hewn installations and sections of ancient roads from different periods. These excavations unearthed flint tools and fragments of pottery vessels dating to the Middle Paleolithic, the Chalcolithic, Bronze and Iron Ages, and the Hellenistic, Roman, Byzantine, Mamluk and Ottoman periods (Kogan-Zehavi 2013a; Kogan-Zehavi 2013b; Zilberbod 2013a; Zilberbod 2013b; Greenwald 2015; Paz 2016; Shalev 2016; Permit No. A-7347). Winepress (F1; Fig. 3). 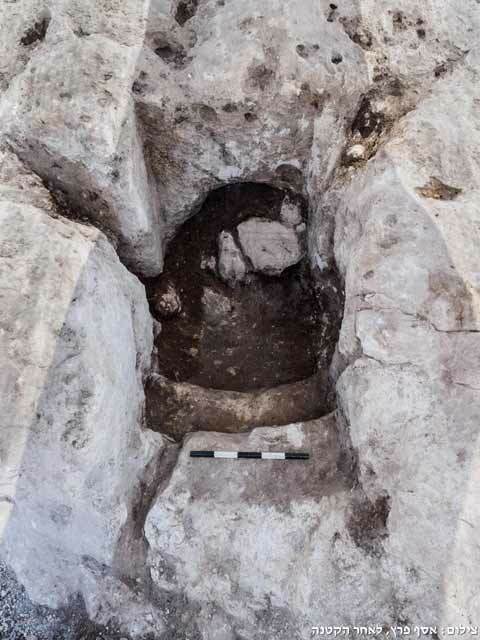 A winepress in which two phases were revealed was exposed in the northern part of the excavation. In the first phase, a rectangular treading floor (L1; 2.2 × 2.4 m; Fig. 4) was hewn in the bedrock. It sloped southwest toward a hewn channel (0.1 × 0.5 m, depth 5 cm) that led to an elliptical collecting vat (L2; 1.0 × 1.3 m, depth 1.4 m; Fig. 5). In the second phase, when the winepress was no longer in use, the collecting vat was widened and served as an access shaft to a cave (F18; diam. 2.25 m, min. depth 0.33 m) that was hewn beneath the winepress. Due to time constraints the cave could not be completely excavated. The finds discovered in and around the winepress included a small number of abraded pottery sherds dating to Iron IIB and the Hellenistic, Roman, Byzantine, Islamic and Ottoman periods. The finds recovered from inside the cave below the winepress were mainly pottery sherds from Iron IIB, including bowls (Fig. 6:1), jars (Fig. 6:2), kraters (Fig. 6:3) and holemouth vessels (Fig. 6:4). Winepress and Cave (F2; Fig. 7). Two rock-hewn installations were exposed east of Winepress F1. 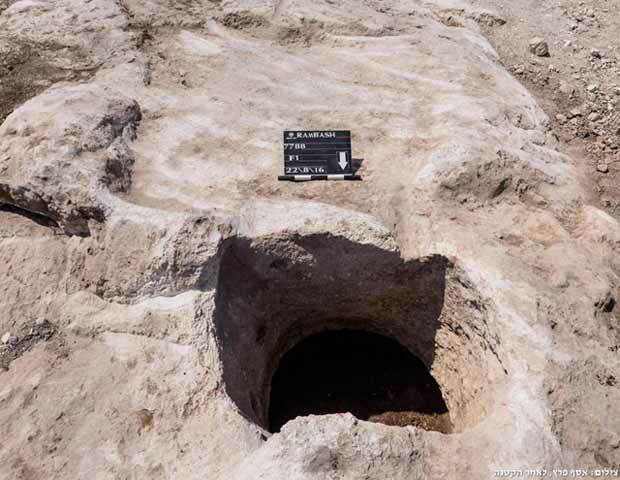 Owing to opposition by ultra-Orthodox entities and time constraints they were only partially excavated. The installations consisted of a complex industrial winepress (F2A; Fig. 8) with a central treading floor. In a later phase, an opening (Fig. 9) was hewn in the floor, leading to a rock-cut cave (F2B; Fig. 10) that may have been used as a ritual bath or a burial cave. The central treading floor (L4; 3.25 × 4.25 m; Fig. 8) had a thin layer of gray plaster (thickness 3–5 cm) still adhering to its northern wall. A rock-hewn channel conveyed the must from the northwestern side of the treading floor to a square collecting vat (L20; 1 × 1 m, min. 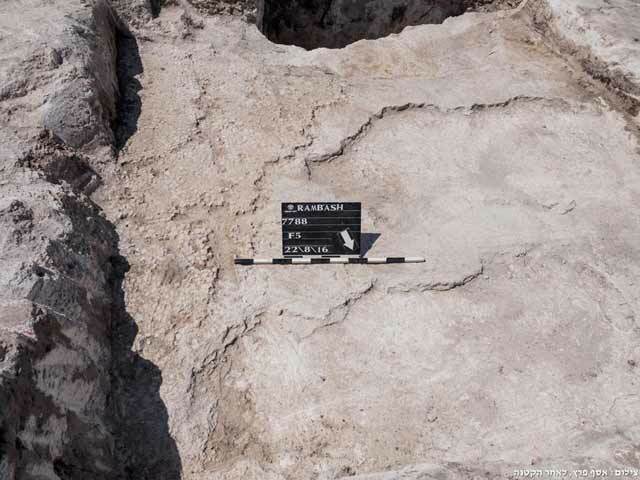 depth 1 m) that still had remains of a thin layer of gray plaster (thickness 3–5 cm) preserved on its northern walls. The collecting vat was not completely excavated. 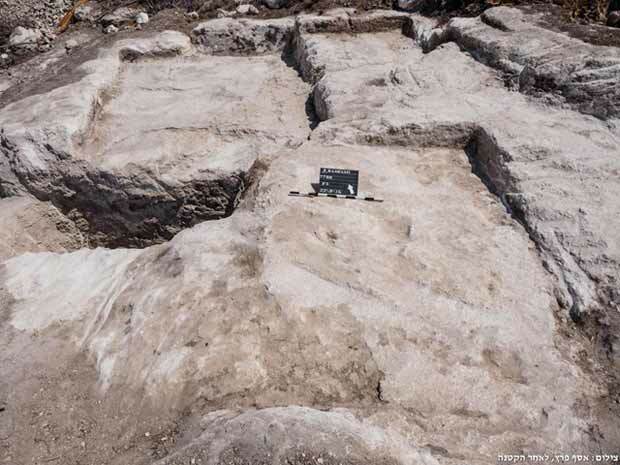 A storage compartment (L3; 1.95 × 2.00 m) and two rectangular niches (0.25 × 0.25 m, depth 6–8 cm) were hewn in the eastern side of the winepress, above the treading floor. Rock-cuttings and a funnel-shaped cavity (L28; 0.15 × 0.18, depth 3 cm) were identified in the northern wall of the winepress, above the collecting vat. Almost none of the treading floor’s western wall had survived. To its west was a cracked channel (L21)—probably natural—and two rock-hewn channels (L25, L26), whose connection to the winepress was unclear. In a later phase, an opening was hewn in the center of the treading floor; it led to a cave filled with accumulated alluvium. The cave was documented but not excavated (Figs. 7, 9, 11). 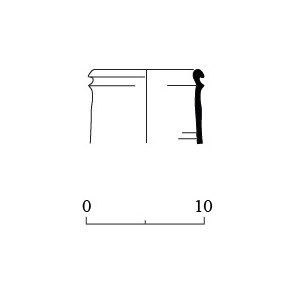 A rectangular entrance (L5; 1 × 2 m, min. depth 1.2 m) opened into an underground chamber (L27; 5.0 × 7.3 m, min. height 2 m) that contained accumulations of soil mixed with Ottoman-period pottery sherds and modern refuse. The cave’s northeastern wall was lined or repaired with medium-sized to large fieldstones, some of them roughly hewn (height 1.4 m; Fig. 11). Sherds dating to the Roman, Byzantine and Ottoman periods were collected from the accumulations on the treading floor, and abraded sherds and a Byzantine-period jar (fourth–seventh centuries CE; Fig. 12:1) were recovered from the soil excavated in the collecting vat. It was not possible to determine with any degree of certainty the date of the winepress or the cave; however, complex winepresses such as this have been dated to the Roman and Byzantine periods. Cave (F2B). A rock-hewn cave (Figs. 7, 10) covered with alluvium was revealed south of Winepress F2A. It included a tomb facade aligned east–west, leading to a rectangular front courtyard (L6; 1.2 × 2.0 m, min. depth 1.7 m) equipped with at least three rock-hewn steps leading to an elliptical opening (width 0.8 m, min. height 1 m) that had been blocked by a roll-stone, removed prior to the excavation. The cave was only excavated from the front courtyard to the elliptical opening because of objections by ultra-Orthodox factions. The excavation in the courtyard of the cave yielded worn non-diagnostic potsherds. The nature of the cave could not be ascertained; it may have been used as a burial cave or a ritual bath, neither of which could be confirmed. South of the cave were rock-cuttings (L7; 0.45 × 0.70 m, depth 0.25 m) whose nature and connection to the site were unclear. Quarry (F3). Remains of a quarry (L8; 2.2 × 2.5 m; Figs. 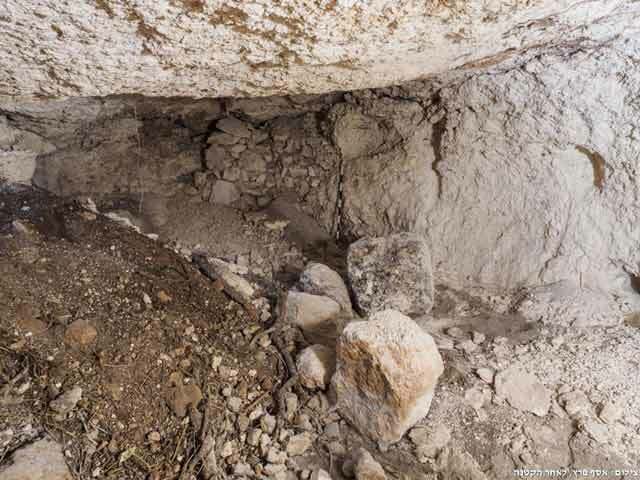 13, 14) severely damaged by mechanical equipment prior to the excavation were exposed southwest of Cave F2B. The pottery sherds found there were abraded and insufficient for dating the quarry. Pit (F4). 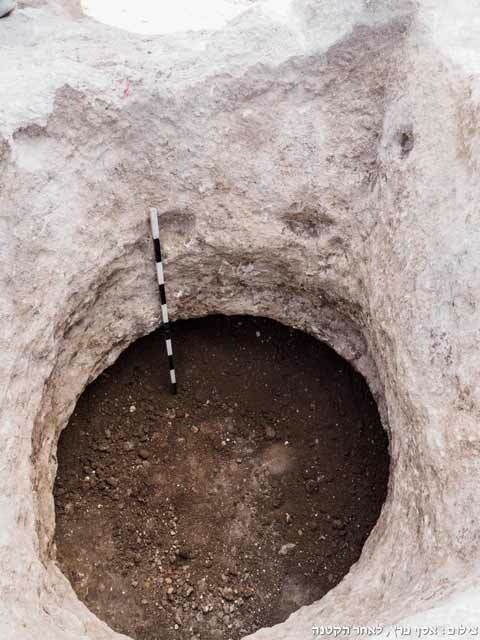 Remains of a pit (L10; 1.6 × 1.8 m, depth 0.4 m; Figs. 13, 15) hewn in a bedrock outcrop were exposed west of the quarry. It had been severely damaged during earthmoving work conducted at the site prior to the excavation. 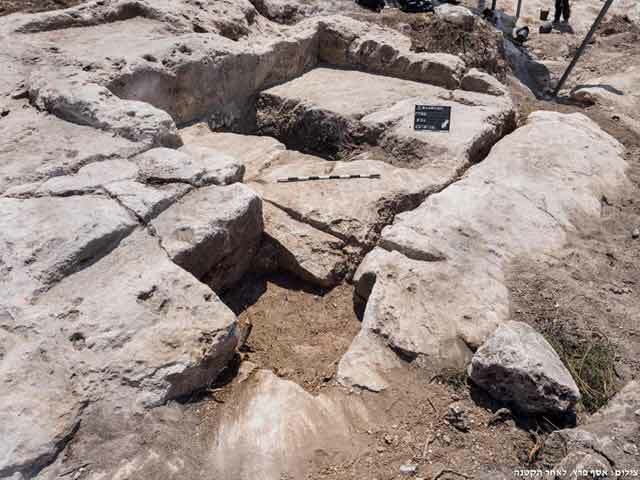 A partially worked bedrock floor abutted the western and southern walls of the pit; it probably served as a work surface for producing wine or oil. No datable material was collected from the pit. Winepress (F5). A rock-hewn industrial winepress (Figs. 16, 17) was exposed in the southernmost part of the excavation; it too was severely damaged during the work that preceded the excavation. The winepress consisted of a square treading floor (L14; 3.6 × 3.6 m, depth 0.3–0.5 m) that drained via an opening in its southern wall into a rectangular collecting vat (L12; 1.3 × 2.4 m, depth 2 m) coated with a thick layer of gray plaster (c. 8 cm) and two storage compartments, hewn east and south of the treading floor (L11; 2 × 2 m, height 0.2–0.4 m; L13; 2.5 × 3.6 m, height 0.2–0.3 m). On the treading floor were the remains of a mosaic floor founded on a thick layer of gray plaster (thickness c. 7 cm; Fig. 18). 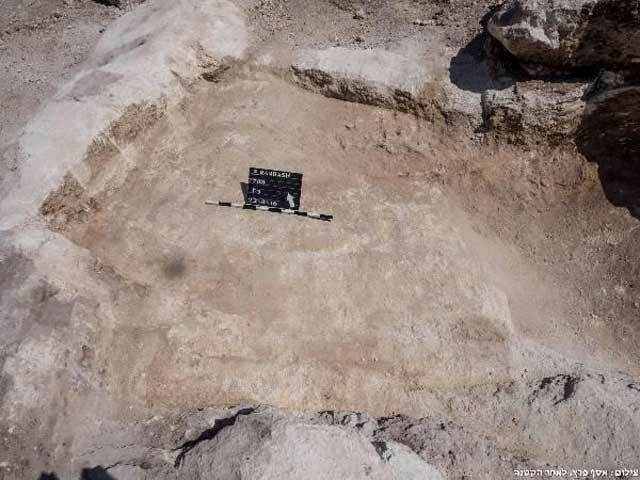 The connection between the treading floor and the two storage compartments did not survive due to the damage the installation had sustained prior to the excavation. No datable material was collected from the winepress, but it is reminiscent of the complex type of winepress that is characteristic of the Roman and Byzantine periods. The rock-hewn remains exposed attest to industrial-agricultural activity associated with the nearby sites that were revealed in previous excavations in the area. The ceramic finds collected from the alluvium covering the remains date to Iron IIB, and to the Hellenistic, Roman, Byzantine, Islamic and Ottoman periods; however, they are devoid of any stratigraphic context and therefore do not necessarily reflect the time the installations were created or used. Winepresses F2A and F5 can be ascribed to the Roman and Byzantine periods based on parallels that were exposed at other sites with datable assemblages. Since the finds in the cave below Winepress F1 were mainly pottery sherds from Iron IIB that may have been swept into the installation in later periods, it is impossible to date the winepress or the cave that canceled it. 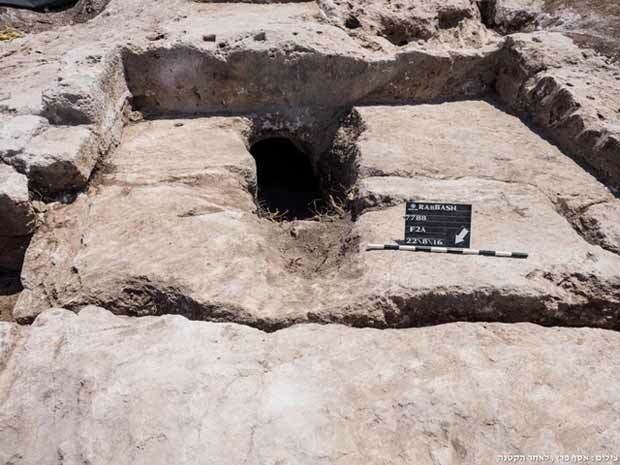 Rock-hewn ritual baths and burial caves are a phenomenon that appears over the course of extended periods, and Cave F2B, which was exposed in this excavation, is similar in its technological and technical characteristics to those of the Roman and Byzantine periods. It was not possible to date either Quarry F3 or Pit F4. Greenwald R. 2015. Nahal Yarmut (A). HA-ESI 127. Kogan-Zehavi E. 2013a. Bet Shemesh, Ramat Bet Shemesh (A). HA-ESI 125. Kogan-Zehavi E. 2013b. Bet Shemesh, Ramat Bet Shemesh (B). HA-ESI 125. Paz Y. 2016. Bet Shemesh, Ramat Bet Shemesh, Neighborhood C2. HA-ESI 128. Shalev O. 2016. Bet Shemesh, Ramat Bet Shemesh, M3. HA-ESI 128. Zilberbod I. 2013a. Nahal Yarmut (A). HA-ESI 125. Zilberbod I. 2013b. Nahal Yarmut (B). HA-ESI 125. 3. F1, winepress, plan and section. 4. F1, winepress, looking south. 5. F1, collecting vat and cave, looking east. 7. 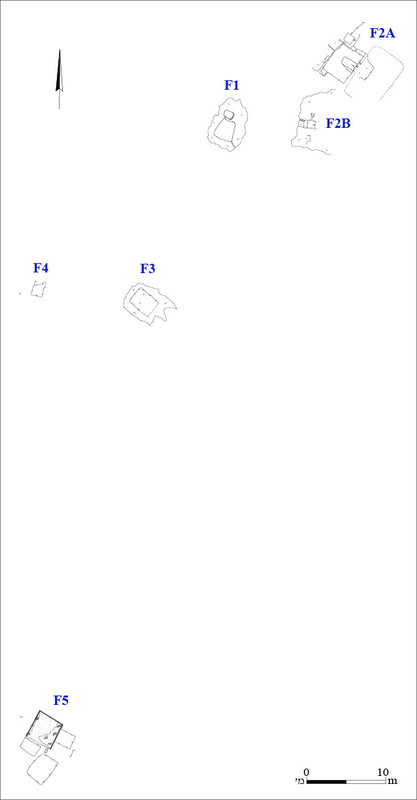 F2, winepress and cave, plan and section. 8. F2A, winepress, looking north. 9. F2A, winepress and cave opening, looking southeast. 10. F2B, cave, looking east. 11. F2A, cave chamber, looking north. 13. 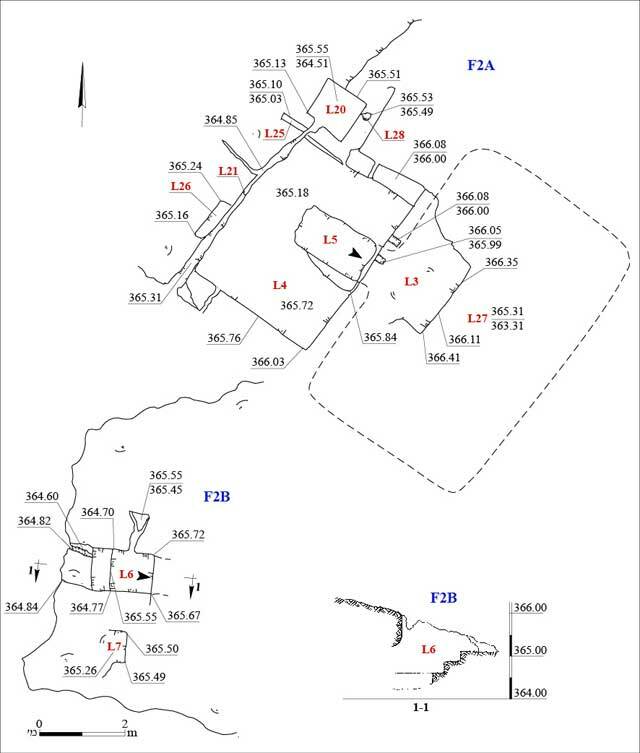 F3, F4, quarry and hewn pit, plan. 14. F3, quarry, looking northeast. 15. F4, hewn pit, looking east. 16. F5, winepress, plan and section. 17. F5, winepress, looking northeast. 18. F5, the mosaic floor in the winepress, looking south.